Ryan Nall didn't play a down for the Chicago Bears, but he still feels it was a season of accomplishment. 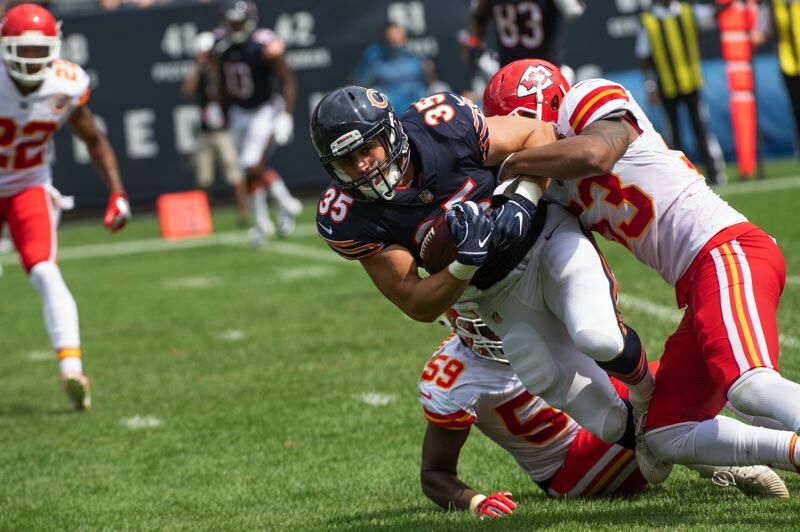 "It's been a great learning experience," said the former Central Catholic and Oregon State standout, who was on the Bears' 10-man practice squad as a rookie running back all season. "I'm staying positive. Even though I haven't been called up (to active duty) yet, I've had a chance to keep growing and learning and getting better." The 6-2, 235-pound Nall left after his junior season in 2017 with OSU — where he rushed for 2,216 yards and 24 touchdowns and caught 56 passes for 563 yards and four touchdowns in three years — to enter the NFL draft. And then he went undrafted. Pundits suggested his 40-yard dash time — he ran 4.58 seconds at the NFL Combine and 4.53 during the Beavers' Pro Day — and questions about what position he would play in the pros (running back? fullback? tight end?) contributed to his being bypassed by all 32 teams. "Getting drafted was the hope, always my dream," Nall said in a phone interview from his Chicago apartment last week. "Unfortunately, it didn't pan out the way we expected. But it worked out for the best. I ended up in a good situation in Chicago." Nall, 23, drew interest from several teams as a free agent, most of whom saw him as a hybrid (tight end/fullback) type. "(The Bears) wanted me as a running back," Nall says. "That drew me in." That and the hiring of former Oregon head coach Mark Helfrich as offensive coordinator. "There was a history with me and Coach Helfrich," said Nall, who rushed for 155 yards and four touchdowns in the Beavers' 34-24 Civil War victory as a sophomore. "He had confidence in me as a running back candidate." Nall was one of Chicago's brightest lights during the preseason. In five games, he carried 32 times for 223 yards, a 7.0 average). He broke one for 69 yards against Cincinnati and had a 32-yard TD run vs. Buffalo in the final exhibition game. Nall also played on all four special teams. "I never played special teams after the first part of my freshman year at Oregon State, so that was good experience for me," he said. "It's different, flying down the field trying to make plays." There was speculation in the Chicago media that he might be a surprise inclusion on the 53-man roster for the regular-season opener. But the Bears are deep at running back, and they kept four at the position: 6-foot, 225-pound Jordan Howard, their lead back who had 935 yards and nine TDs in the regular season; 5-6, 180-pound change-of-pace specialist Tarik Cohen; 5-10, 220-pound special teams standout Benny Cunningham; and 5-10, 185-pound Taquan Mizzell. The Bears, who lost their wild-card playoff game 16-15 to Philadelphia on Sunday, could have released Nall, but they placed him on the practice squad. "They see me as a running back for the future, and they wanted to develop me for a year," Nall said. "I know I left everything that I had out there on the field during the preseason. The coaches saw that. They see the potential I have and the growth I've shown, and that I love the game and want to be here in Chicago." Nall rented an apartment in Vernon Hills, 10 minutes from the Bears' training facility in Lake Forest. He has spent the entire season with the Bears. "The best way to describe it, I'm a part of the team, but I don't suit up for games," he said. He has served as a running back for what is known as the "scout team" in college football, going against Chicago's defense through the week leading up to a game. In the week before the Bears' playoff game against Philadelphia, Nall played the Eagles' Josh Adams. "I could have still been in college this season," Nall said. "Instead, I'm going up against the best defense in the NFL every single day." Nall was on the Bears' sidelines during games at Soldier Field, though he did not travel with the team for road games. "I'm in meetings through the week," he said. "I'm part of the team in the locker room during (home) games. At practice, I give (the Chicago defense) the looks they need, and sometimes the coaches throw us in there with the offense with the '3's' (the third unit). I've even played some (scout-team) defense — nickel and a little bit of linebacker — because of injuries. "It reminds me of college a little bit. Wake up, go to football and come home — except there are no classes to worry about." Nall has enjoyed being with Helfrich and Chicago head coach Matt Nagy, who led the Bears to a surprising 12-4 regular-season record, the NFL North title and the franchise's first postseason berth since 2010. "It's a great organization, and these coaches, they actually really care about us as people," Nall said. "I've heard around the league that some coaches are in it for the money, to get their payday. With the Bears, they care about our well-being. They want to make sure you succeed, on and off the field." Nall has had a little time to learn Chicago. "I've been down to the city a couple of times," he said. "I took my fiancee and went shopping and did all the tourist stuff. It's a great city. I love it. The people are great, and there are tons of things to do." That's right, fiancee. Nall and Sophie Presley will tie the knot in Portland in June. Ryan has been dating Sophie — a Clackamas High grad who is finishing up the nursing program at Clackamas Community College — since their high school years. Nall will spend most of the offseason in Portland, planning the wedding and working out to prepare for organized team activities (OTAs) and training camp with the Bears next summer. Chicago's running backs are young — Howard is 24, Cohen is 23 and Mizzell is 25 — but Nall will arrive at camp with optimism. "In my heart, I'm the best running back I know of," he said. "I'm going to try my best to win a spot. I welcome the competition. It's up to the coaches to make that decision, but I'll play my game and hope that's good enough." Nall said he followed his college alma mater closely last fall during the first season of the Jonathan Smith era. "I watched several games on TV," he said. "I texted a few of the guys through the season. It was a tough season to watch, but I'm excited for the future. It looks promising. The offense was rolling, and there are a lot of young guys on defense. If they stick to the scheme and trust the coaches and continue to develop, they're going to be OK."